What exactly is Crysis Multiplayer Network ? This Network works as complexed alternative to GameSpy for Crysis multiplayer and was started in July 2014 by modders and biggest fans of the game for other players all over the world. All you need to have is your Crysis 1 game. If you still don't have the game, you can buy it as DVD version or purchase it on-line from "origin.com" or "steampowered.com", for very low prices. This network is 100% non-commercial project and doesn't accept any donations from users. It's free to use for all players and open for any community which wishes to start their own servers and play here with friends. Many MP and servers features were improved since GameSpy's disconnection - to make new solution much more advanced and more comfortable to use than the old multiplayer. Do I need to register here and How to create an account? No you don't have to register to play on all servers and maps which are on-line on the list. Just simply open the game with new shortcut or use www servers list and enjoy playing. But if you want to have unique Nick/ID, if you care about saving your statistics and you want to put PP in your bank or would like to exchange informations with other players on chat or forum - you will need to create an account here. You can simply get an account by clicking "Log-in" in top-menu or by this link.. Remember that you don't need this account for basic playing. To play Crysis 1 MP all you need to do is justdownload Crysis Multiplayer Network client mod, install it and start game with new shorcut on your desktop called "Crysis-Multiplayer". If you still are not sure you can check Detailed Tutorial showing how to install and use CryMP client. Please use original copy of Crysis 1 to be fair and avoid piracy. If you want to buy the game - you can get Crysis DVD ver. 5767 in any gaming shop or just purchase Origin / Steam on-line - ver. 6156. How do I connect CryMP.Net Crysis servers ? To to join any server, just type ID (number) of desired server (1,3,8,12....) and press "enter". You will be connected to this server in few seconds. 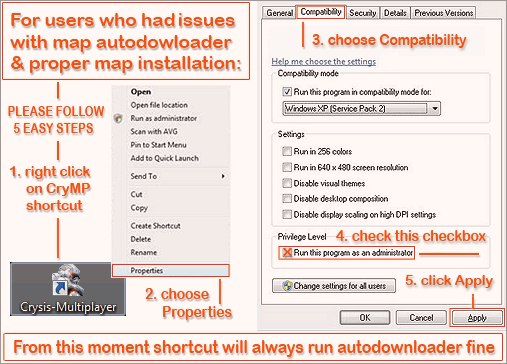 If server is using custom map - autodownloader will be launched automatically. After automatic process of downloading and installing the map you will be switched directly on server and you will be able to enjoy the game. Other, easy way of joining servers - which works since lates multiplayer client/connector is using classic in-game list. All servers should be accessable with standard Crysis server list. You can also use www servers list to check what map, how many players and who exactly is on each server. To join server by www servers list just click "Join" button and localize your Crysis folder. Game will start and you will be connected dirrectly to the server. Can I run my own server and make it appear on the list ? You can very easily do it just by downloading latest SSM SafeWriting directly from here and install it. Just feel free to run and mod your servers for free on your home PC and play with friends. Your servers will show up on servers list as "private" ones. Please read latestTUTORIAL for SSM SafeWriting Serverbefore installing it. Thanks to it you won't get any problems and everything should run smoothly. My Crysis crashes after I launch the game - what should I do? 1. Go to your Windows "User" folder in "My Documents/My Games/Crysis/Profiles"
2. Rename "Profiles" folder to "Profiles2" or just remove it (make sure you have copy of it just in case). 3. Try to launch the game again. After the start Crysis creates "Profiles" folder again and it shouldn't crash anymore. I have unpatched version of Crysis (5767) and can't access patched servers (6156). What to do ? If you have only basic (the one which comes on DVD) version and you want to play patched one (more popular nowadays) you can buy Crysis from "origin.com" / "steampowered.com" - they give already patched version now - or simply patch your version with official Crytek's patches. Patch 1.1 + Patch 1.2 + Hot Fix 1.21 - Downloadable from: Official Crytek's website. Remember that you can keep both versions of Crysis on your PC - so you would be able to play both kinds of servers, simply switching from one to another. That is helpful if you're fan of classic Crysis 1 MP - Circle Jumping Flying glitch which works only in 5767 version. If you don't know how to do it - you can check out this simple video tutorial - How to have both, legal versions on single PC. I can't enter servers with custom maps after map downloading process - How to fix that? but extracts it to your "User" folder, so Crysis can't find it and you're being kicked from server. There is very easy way to fix this. I get kicked while clicking some server from (in-game) classic server list. Is that normal? Yes it's 100% normal. Classic in-game servers list is just an extra list added to both basic lists of CryMP.Net (console list and www list) so we can't take responsibility for all servers that are shown on that extra (in-game) list. Our OFFICIAL servers that you are able to enter are only !HS (Hot Spot) and [FP] (Fair Play) servers (around 15 servers). The rest of servers are private servers of users (some can have errors or wrong settings) or just servers of some other closed communities who will always kick you without a reason because they don't want you to join. This is why you will always be disconnected while trying to enter some of those unofficial ones. To make sure you won't get any problems - please try to enter only official servers that are listed on www servers list. during weekends - you will never get disconnected or kicked by anyone, will meat only nice people and trusted admins - who will always help you with Crysis MP. I'm using AMD FX CPU. My Crysis crashes during the launch. Is there some way to fix that? Well. Yes and No. It depends. Many people with AMD FX processors can't even start the game. This is why we have prepared few fixes for this problem. For some of users that works fine. Please read forum thread about it before trying to solve it your way. Here: /forum/thread.php?id=162&lu=1455143919 and Here: /forum/thread/256/AMD_FX_and_Crysis__refreshed_iss. It should help most of the time but AMD FX can be still a huge problem for small group of players.